When it comes to telescopes, astronomers are like muscle-car enthusiasts: give them the most powerful machine ever built, and they'll be satisfied ... for a little while. Then they start thinking about how much they could do with just a little more horsepower  or better still, a lot. The most intriguing, mysterious objects in the universe always seem to lie just beyond the faint edge of what's barely detectable with existing technology. If only there were telescopes with bigger mirrors, packing more light-gathering power, observers could finally figure out what's going on out there. This has been the stargazer's lament ever since Galileo built his first scope back in 1609, and over the years, astronomers have been feeding their addiction with ever larger instruments, culminating in the twin giant Keck telescopes, with mirrors an astonishing 33 ft. (10 m) across, which went into operation in the 1990s atop Mauna Kea mountain in Hawaii. But astronomers are finally getting the upgrade they've so desperately (and predictably) wanted. 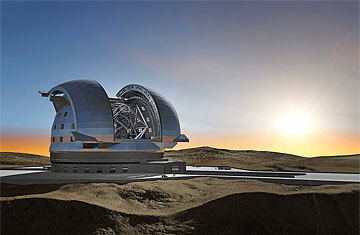 At least three giant-telescope projects are now under way, and the biggest of them, the European Extremely Large Telescope, or E-ELT, has just taken several significant steps toward what observers elegantly call "first light": the Chilean government has donated the land for the telescope, and the European Southern Observatory, the governing body for the project, has authorized work on both the mirrors and the access road to the site. That may not sound like a big deal, but for a project that's been a gleam in astronomers' eyes for more than a decade, the commencement of actual work is no small thing. Originally, the member governments of the European Southern Observatory consortium were dreaming even bigger: they had a proposal on the table for something they called, appropriately, the Overwhelmingly Large Telescope (OWL). Its light-gathering mirror would have been a whopping 328 ft. (100 m) across, wider than a football field is long. The OWL would have also been overwhelmingly expensive to build, though, so the designers toned it down to a mere 128 ft. (39 m) and lost the overwhelmingly label from the name. Even shrunken to that size, the E-ELT will have more than 15 times the light-gathering area of the Kecks  and will presumably make astronomers 15 times happier. The scientists' delight is likely to be justified since the E-ELT might help answer some of the greatest mysteries in astronomy. It could, for example, see the very earliest galaxies as they first burst into light at the dawn of the universe. It could make highly precise measurements of the dark energy that's causing the universe to expand faster all the time  and maybe help answer the question of what this bizarre force really is. The E-ELT might also be able to spot earthlike planets orbiting distant stars, and even examine their atmospheres to see whether life might exist there. And, just as always seems to happen when astronomers get a powerful new toy, the E-ELT will almost certainly discover things nobody has yet imagined possible. None of that will happen until the early 2020s, though: such a huge and complex instrument takes a while to construct. But given that an independent review panel has declared the project's $1.4 billion budget to be realistic, there's little reason to doubt it will happen. In the meantime, astronomers can hope that another huge instrument, the Giant Magellan Telescope (GMT), will be finished by 2019 as planned, also in the high desert of northern Chile. The mirrors for the GMT are currently being built at the University of Arizona, by a multinational consortium that includes Harvard University, the Australian National University, and the Korea Astronomy and Space Science Institute. The GMT is a bit smaller than the E-ELT, with seven 28-ft. (8.4 m) mirrors that will combine to create the equivalent of a single, 83.5-ft. (25.448 m) one. The E-ELT, by contrast, will be made of more than a thousand 5-ft. (1.5 m) mirrors. And then there's the Thirty Meter Telescope (TMT), with 492 small mirrors working together to simulate a big one. The TMT is slated to go on Hawaii's Mauna Kea, near the twin Kecks (fittingly, since University of California, Santa Cruz, astronomer Jerry Nelson designed the Kecks and the TMT). By the early 2020s, then, there could be three brand-new sets of gigantic eyes on the sky, peering to the very edge of the universe and into the cores of glittering galaxies  and solving cosmic mysteries by the bushel. That should keep astronomers happy for at least a few years  until they start thinking, once again, "Wouldn't it be great to have a really big telescope?" Read "A Telescope as Sharp as Hubble  but on the Ground." See the best photos from space in 2011.